This page created 5th November 2014. 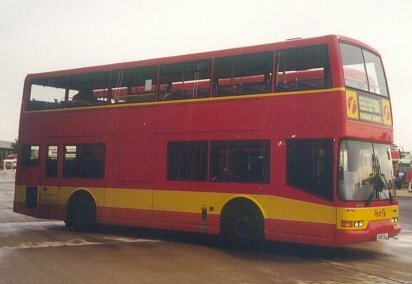 Capital Citybus had good experiences with Dennis Dominators, and with Northern Counties Palatine II bodywork (on Volvo Olympians), so it was not altogether surprising that they chanced their arm with the new Dennis Lance-chassised Arrows in 1996. This was a bigger bus than the Volvo Olympians with Palatine I bodies ordered at the same time, the Arrows seating 82 and the Olympians 74. Five of the nine were delivered in an orange and white dedicated livery for a contract to operate the East London line while it was being rebuilt as part of the Overground network. They operated the ELX service from Hackney garage. 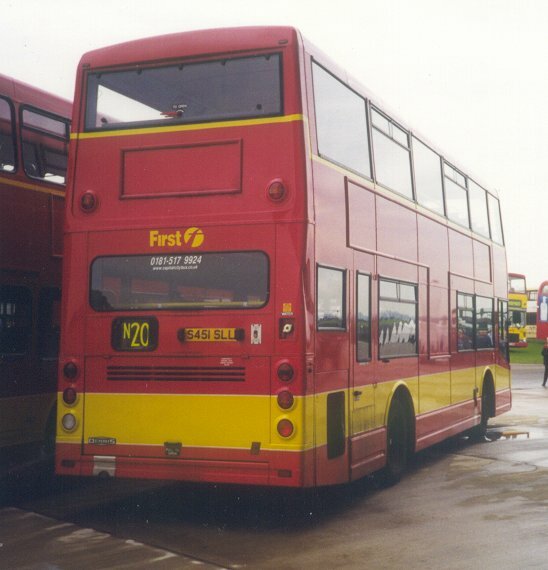 The remainder of the batch were delivered in yellow with red trim, Capital Citybus standard livery. One oddity is that they were reregistered in May 1997, from P9**HMH to P4**PLE marks, presumably to give registrations in line with their fleet numbers. They were downseated by 2 to H47/33F at the same time. The ELX contract came to an end in spring 1998, and the orange five were repainted in standard yellow. They were then used variously from Dagenham or Hackney until 2001 or 2004, when they were withdrawn from London service and despatched elsewhere in the First domain, mainly First Leeds for express services, and later, like the others, to First Manchester. 410 was seriously damaged in the rear by a lorry in July 1998. It reappeared from repair wearing the new First Capital livery of red and yellow with white relief. P406PLE, now First Yorkshire 31906, in service in Leeds, August 2005. Another four were bought from dealer stock in late 1996. They were distinguishable by having three-track number blinds (until May 1998, when they were converted). They went first to Hackney, then moved around quite frequently between all three garages (H, DM and NP) as the need arose. 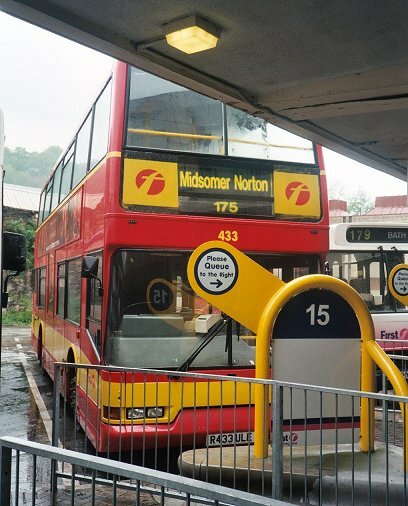 All except 415 went north to Leeds in 2002, but 415 hung on at Northumberland Park for a schools contract, then followed the others in early 2004. Like the first batch, they joined the rest of the Arrows with First Manchester. 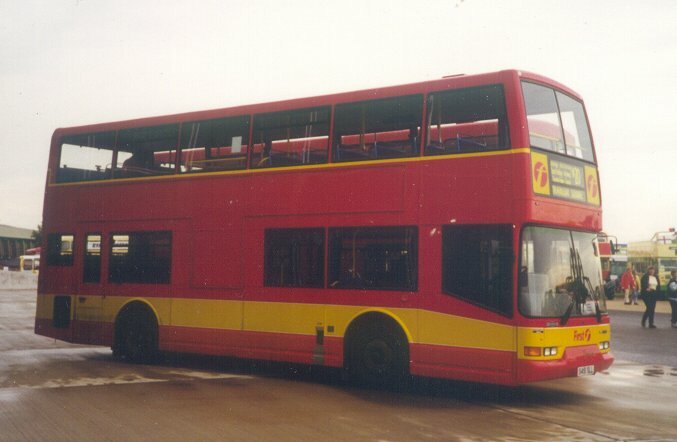 In May 1997 Capital Citybus bought nine more Arrows, this time with bodywork by East Lancs - the Pyoneer. These arrived in yellow for route 369 (Ilford - Barking - Thames View Estate), newly won on tender for a start in July. These were followed by another bus (426) that was exhibited at the Bus & Coach Show. 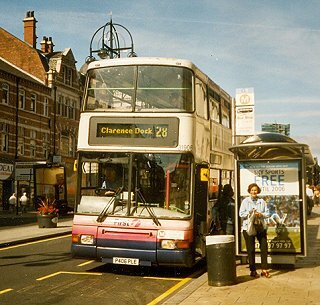 Another twenty-six (427-452) were ordered for spring 1998, to take over Tottenham's Metrobuses on routes 76 (Waterloo - Northumberland Park Stn) and the abbreviated 259 (Kings Cross - Edmonton Green Stn). They also took on the N20 (Trafalgar Square - Barnet Church). 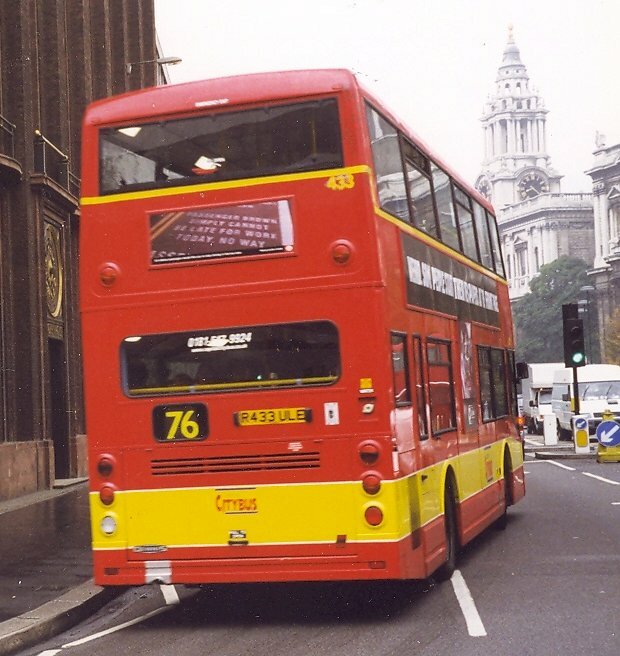 For these routes, penetrating into the inner areas, the buses were liveried in accordance with TfL's 80% rule, with an outstanding livery of red with yellow and white. 427-452 worked from Northumberland Park garage. Two more (453 and 454) were added to the Dagenham complement. 433 passes through the City of London towards St.Pauls on route 76, September 1998. 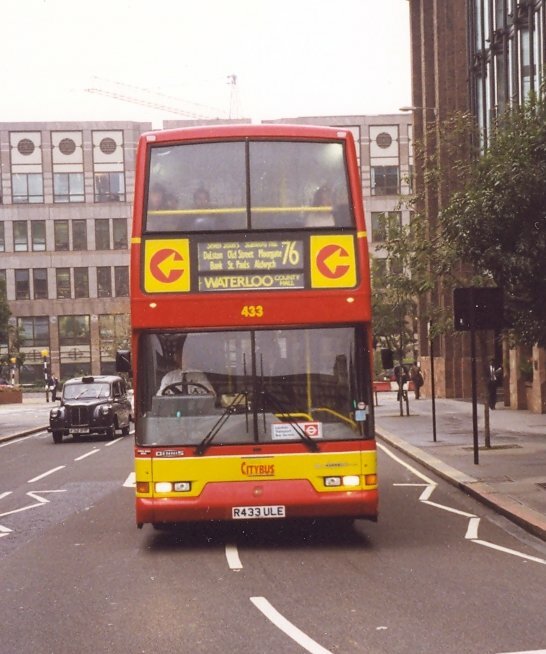 It still carries Capital Citybus symbols on the front panels..
451 at Showbus 98 wore blinds for route N20. It also carries new First Bus logos. 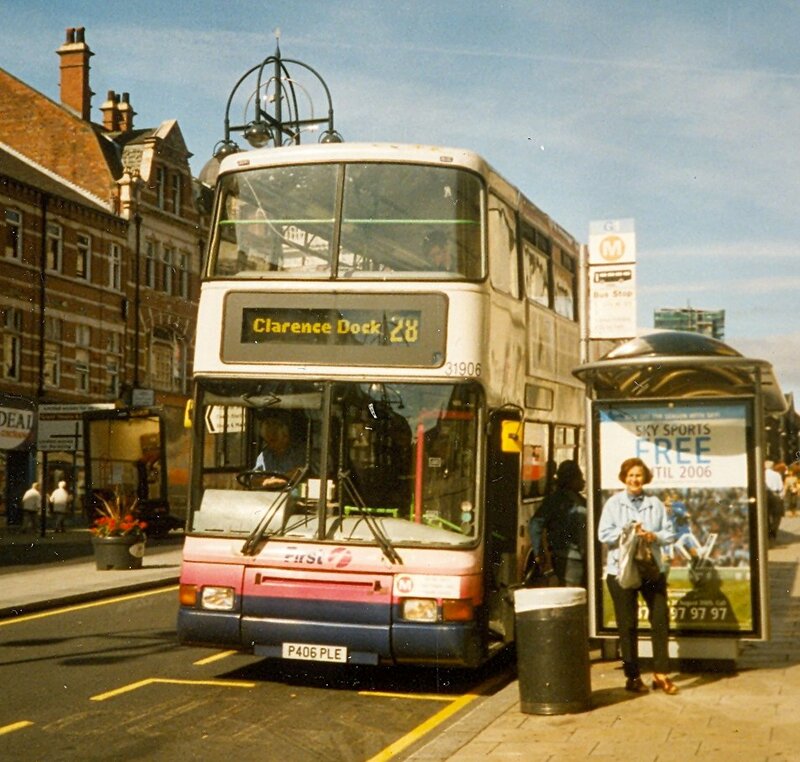 They worked for Capital Citybus - and First Capital from July 1998 - until 2003, when they were displaced by the low-floor revolution, Arriva's VLWs on the 76, First's VTLs on the 259. The Pyoneers then disappeared very quickly from London, going to First Hampshire at Southampton and to First Somerset & Avon (where I saw some in operation in Bath, still in First London livery). They then all moved on to First Manchester, where they joined the Northern-Counties bodied Arrows. They acquired Barbie willow-leaf livery and were converted to single doorway. Some moved back and forth between First Pioneer and First Manchester. Some were transferred to Stagecoach Manchester with the takeover of the Wigan operations in December 2012. 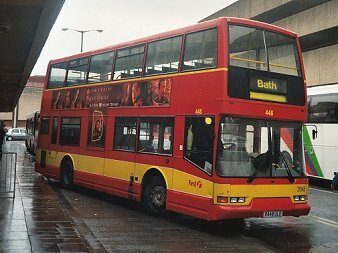 Bath Bus Station: 433 and 448 still wear Capital Citybus livery in April 2004. Ian's Bus Stop Dominator/Arrow index. Arrow text. bus histories. photo references.